Finding a piece of quality furniture for a compact space to study or manage a household can prove to be difficult. That problem is now solved with the not only functional, but stylish Expand-a-Desk. 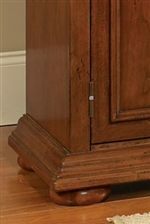 Constructed poplar solids in a Distressed Warm Oak finish with Antique Brass hardware, this desk can be used as a larger night stand, side table, or standalone piece when closed. With a 24.5 inch pull-out side that expands the work surface to 54.5 inches, and two storage drawers and a file drawers, this desk's distinctive design lets you work virtually anywhere in your home. The Homestead Transitional Warm Oak Single Pedestal Expand-A-Desk by Home Styles at AHFA in the area. Product availability may vary. Contact us for the most current availability on this product. Finish Each piece is constructed from poplar hardwood solids and cherry veneers with a multi-step warm oak finish and a clear coat finish helping to protect against wear and tear from normal use. The Homestead collection is a great option if you are looking for Transitional furniture in the area.